Leishman’s work “Front” is a pre-programmed Facebook parody that addresses the major issues of social media – privacy and voyeurism. 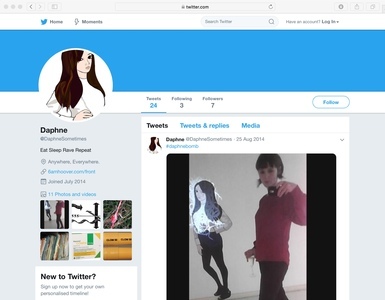 Front’s interface whilst mimicking the immersive, interaction rich promise of social media, instead reminds us of where the power structures lie, and what is often freely given up by the user/viewer. Originally launched as an installation as part of the New Media Scotland: Alt-W showcase exhibition in 2014 for the Edinburgh Art Festival. Venue: Evolution House, Aug 1st - Sat 30 Aug. The project has also been peer selected for 'Interventions: Engaging the Body Politic.' Venue: the cultural centre USF Verftet, Georgernes Verft 12, 5011 BERGEN, Norway. This exhibition was part of the Electronic Literature Organization 2015: The End(s) of Electronic Literature. Aug 4th - 7th 2015. Interaction Design, Critical Design, Social Media, Electronic Literature, Greek Mythology.